Home Food Coffee Bean Strikes Critical Blow Against Starbucks! Victory Imminent! 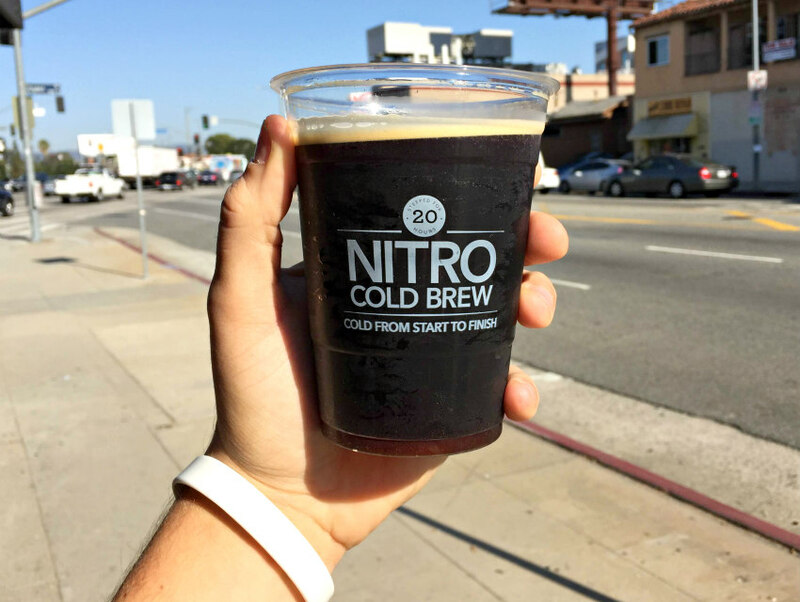 It’s the first major chain to bring nitro cold brew to L.A. Things are heating up in the mass-market, second-wave cold coffee wars (which no one knew was a thing until Starbucks decided it totally existed two months ago, but that doesn’t make it any less important). The internet’s favorite Frappuccino-slinging monolith sounded the victory trumpet in May with an Orwellian press release titled “Starbucks to Seize Multi-Billion Dollar Cold Coffee Market,” announcing the gradual release of nitro cold brew, aka the current holy grail of coffee coolness. Nitrogen-infused coffee debuted at the OG Seattle location early this Summer, and the supposed plan was to eventually roll it out into the L.A. market. I’ve been trying to hunt it down, but after calling a dozen locations in the city, nothing has come up. One Starbucks employee told me that no locations in the city have nitro yet, and she recommended I try a new sweet cream cold brew instead. No way. Nitro or bust. In mid-July, The Coffee Bean & Tea Leaf—Starbucks’ less-cool younger sibling with approximately zero viral rainbow drinks—comes in without the fanfare and self-congratulations and drops a bomb: Nitro cold brew on tap at 170 locations across Southern California, most of which are in L.A. Boom goes the dynamite, indeed. Normally I’m not the biggest Coffee Bean fan (and I don’t know many people who are), but for the past week I’ve been making their nitro cold brew my ritualistic morning caffeine bomb. And it is surprisingly delicious. I’m no coffee snob, but the nitro cold brew doesn’t have the astringent, acidic twang of Coffee Bean’s usual stuff, and the baristas have all been well-trained to get the right amount of foamy head when pouring from the tap. (I once witnessed a semi-awkward but necessary exchange between a manager and an employee after they poured an under-foamed nitro. Quality control isn’t dead). It is creamy, robust, consistent, and an absolute treat. Coffee Bean may not have the cultural cachet and name value of the regional third-wave heavy hitters like Verve, Stumptown, and Blue Bottle, but the nitro cold brew they’re putting out is a vast improvement on any coffee that we’ve seen from a massive chain. Where you at, Starbucks? Next articleAmerican Olympians Only Make $12,000 a Year. Is It Ruining Their Shot at the Gold?